Financial advisors use traditional fact finders to inventory clients' assets and liabilities, insurance, tax and estate issues, and, hopefully, their goals. What these forms often don't ask are questions that tap into clients' fears, strengths, financial mistakes, and hard-fought wisdom—knowledge that could position you to more effectively remove client emotions and irrational behavior from the financial decision making process. Here are four tips to help you dig a little deeper into these more esoteric views. Digging into your clients' fears allows you to anticipate some of the questions and concerns that are likely to bubble up over time. When those concerns arise, you can use your clients' own words to show them that you understand, that you're listening, and that you're there to help them. Here's an example: One advisor had a young widow, Tina, as a client. After seeing his suggestions go ignored for months, the advisor finally asked Tina what she cared most about and what, if anything, worried her. Tina said she was uncertain what to do with the money she got from her husband's life insurance and what he'd want if he were still around. When the advisor asked what she thought he would want, she responded with a clarity that surprised even her. He'd want them to pay off the mortgage, even if it didn't make financial sense, and to pay for college, putting the rest away for retirement. From then on, the advisor knew to frame suggestions not only around what would be best for Tina, but also what she thought her late husband would have wanted. Throughout the financial decision making process, be sure that your suggestions and solutions are in line with the worries clients have presented, and periodically check in to see whether they're more or less worried about those issues and whether new ones have taken over. Whether you specifically ask clients what they're good at financially or just observe them over time, this is a critical item for your fact finder. Think of strengths and weaknesses as the current in a river. People can work on their weaknesses, but it's like paddling upstream. Conversely, when you ask people to use their strengths, they won't have to struggle against the current. Here's an example: Say you have a client, Sam, who needs to save more. If he's analytical, you might ask him to track and assess his spending over a certain period using a spreadsheet. If he's more free-spirited, see if he'd be willing to do a spending "experiment" for several weeks, just to see what he uncovers. For whatever tricky situation clients find themselves in, try to from your suggestions so they line up with clients' strengths. This line of questioning is more straightforward. If a client admits that he lost money chasing a "winning" investment, not only is he less likely to do it again, he's also more likely to accept your help in avoiding that mistake in the future. The same goes for any financial misstep. Once you learn what the error was, reassure your client that it's normal to make financial mistakes. (You may even want to share some of your own mistakes, if the client asks.) Explain that the difference between financially healthy and unhealthy folks is that the former tend to make mistakes only once, and they don't depend on their own willpower to avoid future pitfalls. Instead, they get help from others or set up systems to keep themselves on track. Here's an example: Rather than having them try to quit cold turkey, suggest that habitual over-shoppers leave their wallets in the car, so that their laziness overwhelms their impulse to buy. After all, who wants to go all the way back out to the parking lot to get the money? To help clients avoid repeating past mistakes, ask them what they'd like to do differently next time. And ask if they'd like you to remind them of this if you see the situation crop up again, so you can help manage their emotions through a rough patch in the financial decision making process. Questioning clients about how they relieve stress may seem like a funny thing for a financial advisor to do, but almost all financial mistakes happen when clients are overly emotional. By understanding the resources they can draw from to put them back on solid footing (they might go for a walk or play with the grandkids), you'll have yet one more tool to help your clients succeed. Find out what works for them, and again, get their permission to bring these ideas up later, if necessary. Here's an example: When a client calls asking you to move all of his retirement assets to cash, you might advise him to go play a tennis match and then call back later for a discussion of the pros and cons of going to cash. Making such suggestions may seem like something you'd never do, but if you set the stage ahead of time—before clients have an emotional overreaction—you'll find that they're actually quite receptive to caring guidance throughout the process. 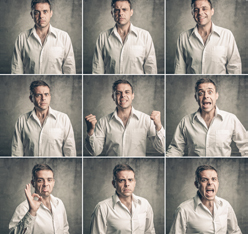 These are just some of the methods that can be effective in managing your clients' emotions. Tell us about your successes—or failures—in the comments below. The preceding is a hypothetical case study and is for illustrative purposes only. Actual performance and results will vary. This study does not represent actual clients but a hypothetical composite of various client experiences and issues. Any resemblance to actual people or situations is purely coincidental.